This Mars Reconnaissance Orbiter image shows a new impact crater in Elysium Planitia that formed between February 2012 and June 2014. A NASA Mars probe has photographed an impact crater that was blasted out of the Red Planet in just the last few years. The HiRISE camera aboard NASA’s Mars Reconnaissance Orbiter (MRO) captured the crater, which lies in the Red Planet’s equatorial Elysium Planitia region, on Dec. 2, 2014. Scientists say the impact that gouged out the hole must have occurred between February 2012 and June 2014, based on previous images of the area. The crater is about 40 feet (12 meters) wide, said HiRISE team member Ingrid Daubar of NASA’s Jet Propulsion Laboratory in Pasadena, California. 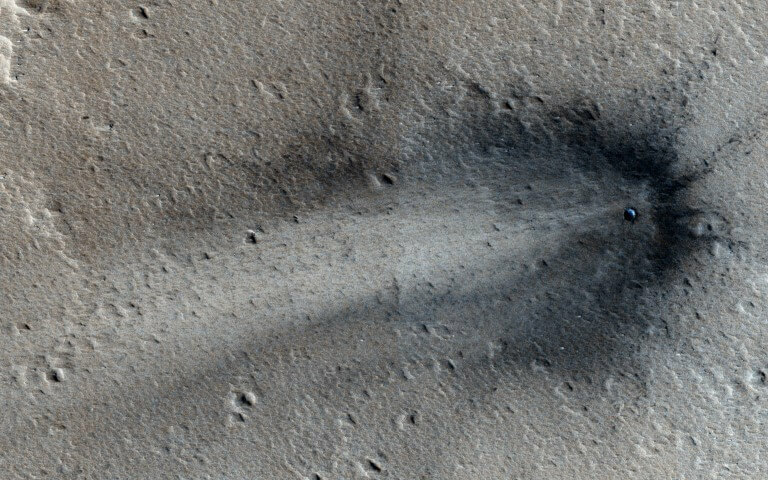 “We’ve been finding new craters like this for a few years now, and from studying their frequency, we’ve come up with a cratering rate for Mars based on them,” Daubar told Space.com via email. The new photo is the first one HiRISE — short for High Resolution Imaging Science Experiment — has taken of the crater. The feature was actually discovered by MRO’s Mars Context Camera, NASA officials said. The objects that create Martian craters such as this one strike the surface at very high speeds — an average of 22,000 mph (35,400 km/h) — and are almost always completely destroyed in the process, Daubar said. The $720 million MRO mission launched in August 2005 and arrived in orbit around Mars in March 2006. The spacecraft has been studying the Red Planet ever since with six scientific instruments. MRO also serves as a vital communications link between Earth and NASA’s active Mars surface craft, the Opportunity and Curiosity rovers.